That’s right, Grasshopper – FREE. 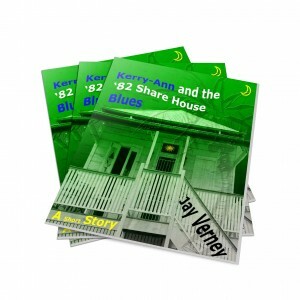 Here’s a short story titled Kerry-Ann and the ’82 Share House Blues. It’s in pdf form, so you can read it on your laptop or PC with an Adobe Reader, or print it out. Or click the image below if you’re the visual type – I know I am. Either way, enjoy, and send feedback – not sweary feedback – my cat gets an upset stomach with expletives, as she prefers pilchards.